Ming Lee Simmons is definitely making a name for herself outside of that of her famous parents, Kimora and Russel Simmons. This talented Renaissance woman eloquently finds a way balance it all. 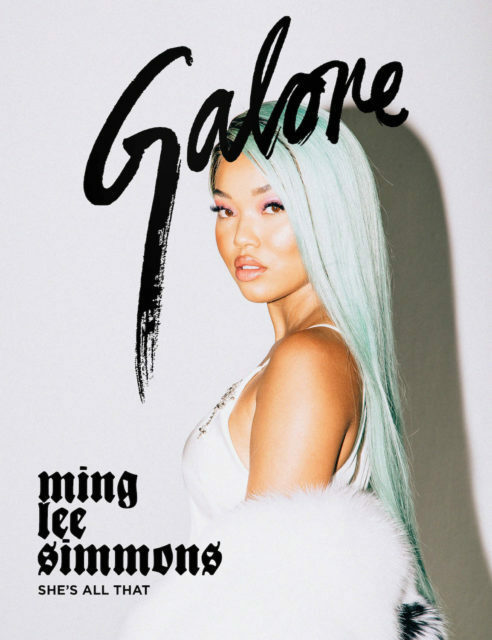 Recently, the young rising start posed for her first magazine cover and interview with Galore. Check out a snippet of what she had to say below in regard to fashion, music, and more. Hi Ming, glad we could connect! You’ve been busy lately. Recently you shot the Galore September cover. Ming Lee Simmons: Same here. Our shoot was next level, right? The photos came out great, I think. Definitely. And since then, you’ve been on the move. You’re enrolled at NYU and starting your freshman year, so tell us – NYC to LA? MLS: That’s not a fair question at all (laughs)! I was raised bi-coastal, so there never really was an “or.” They’re both great places with different vibes. I feel lucky to be going to school in NYC since it’s a hub for fashion and beauty. Speaking of which, what are some of your favorite upcoming trends for Fall? MLS: I know I’m planning to delve deep into OTKs…over the knee boots are where it’s at for me. There’s such a power there. I’m also going to fully embrace plaid. Forest green is going to be big this season, too, which is great because it’s such a rich tone. Ok now which trends do you low key want to see die off this season? MLS: Crocs! I’m not a crocs girl at all. No? They’re definitely trending in certain fashion circles. MLS: Can rubber shoes be shoes, though? They’re just visual pollution to me. Are you hype for for NYFW? What are some of your plans? MLS: I’ve gotten some invites to a few great shows, so I’m excited about that. My mom is speaking at the United Nations Women’s conference at the top of Fashion Week. She’ll be addressing key global women’s initiatives so I’ll be proud to join her for that. She’ll also ring the bell at the NASDAQ, which is such an honor. I’m also proud to help launch the Galore September issue. Right back at you! Okay so tell us about your public finsta, @mingleesimmons2. MLS: My main account – @mingleesimmons – is more of a portfolio of images I’ve created sometimes in partnerships with lifestyle brands I work with. Hair, nails, fashion, and cosmetics. I look at them more as collaborations than endorsements. I like crafting images. @mingleesimmons2 started as a separate account to post silly things but now it’s almost 100% HUJI-based. The posts are random things that I do as seen through the eyes of this HUJI App, which I love. It makes everything look so different. I should be their spokesperson, really. Everyone should have it. To read the interview in its entirety, click here. Congratulations, Ming! We definitely know this is going to be the first of many covers for you!